Spring is finally in full bloom, which means now is the time to replace any missing or dying plants in your yard. Plus, having enough plants in your front yard and parkway is a great way to keep those pesky compliance notices from landing in your mailbox. Here is some advice from your friendly Community Life Team. This is just a fancy word for landscape that uses very little water because it’s made up of drought tolerant plant species. Hardy plants like Sage, Orange Jubilee, Valentine bush, Little John, Natal Plum, Dwarf Myrtle and Lantana species will stay alive with little water. Of course, there are also cacti and succulents, but those should be limited to 1 for every 5 plants you have in your front yard or parkway zone (we will cover accent plants more in just a little bit). Well, it depends. If you live in Inspirian Park your landscape is maintained by the Association and you can skip down to the next section. If you don’t, keep on reading. In all other neighborhoods, the homeowner is responsible for the front yard and the parkway zone. This means you’re in charge of removing weeds (blech!) and maintaining the plants in the area between the street and the sidewalk (but don’t worry, we will take care of the trees). For the parkway we recommend plant varieties like Little John, Lantana, Natal Plum, and Dwarf Myrtle. They will stay closer to the ground with little risk of getting too high. Check out our Master Plant Palette for more ideas for your parkway zone. Look for the handy asterisk(*) next to the plant name. 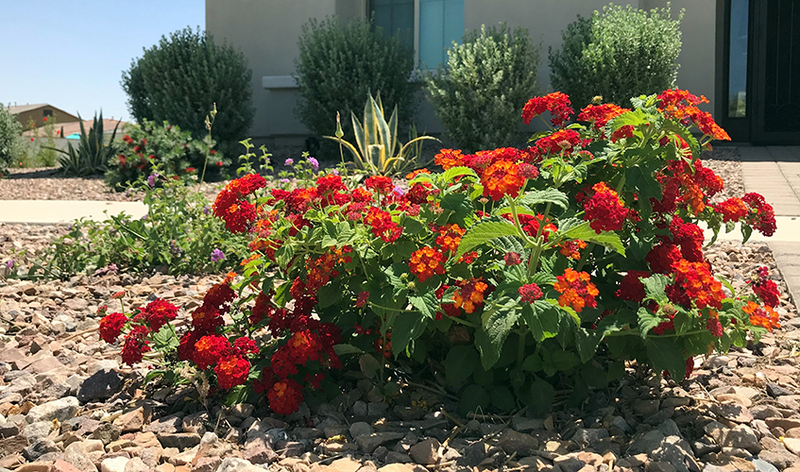 Cacti, succulents and other accent plant species should not make up more than 20 percent of the total amount of plants in the front yard zone. Why? The objective is to have a strong palette of green and leafy plants to create an attractive front yard landscape composition. This is where foundation plants come in. Foundation plants grow a little taller and should be placed closer to the home. Foundation and field plants include Sage, Bougainvillea, Valentine bush, and Orange Jubilee, but you are definitely not limited to just those. The Master Plant Palette has many more to choose from. We also have handy drawings in our Design Guidelines that explain what your yard should look like (check out Appendix H for these colorful examples). You should have one plant every 25 square feet. That’s roughly a 5-foot to 6-foot diameter. If your parkway and front yard are bare, check for irrigation lines sprouting up in the decomposed granite. There’s a great chance there was a plant there once and it would make an excellent home to a new plant. Now is the perfect time to plant. You’ll want to get your greenery of choice in the ground and established before it starts getting too hot. You don’t want to be out in that heat digging holes! If you decide to get fancy and redesign your whole front yard, that’s awesome! We do ask that you kindly submit a Design Review Application and we will have the Design Review Committee review your request before installation. Or, if you would simply like to replace a missing or dead plant with an approved one, we encourage you to do so. If you have questions we are always available to help. Please email us if you should need any assistance.